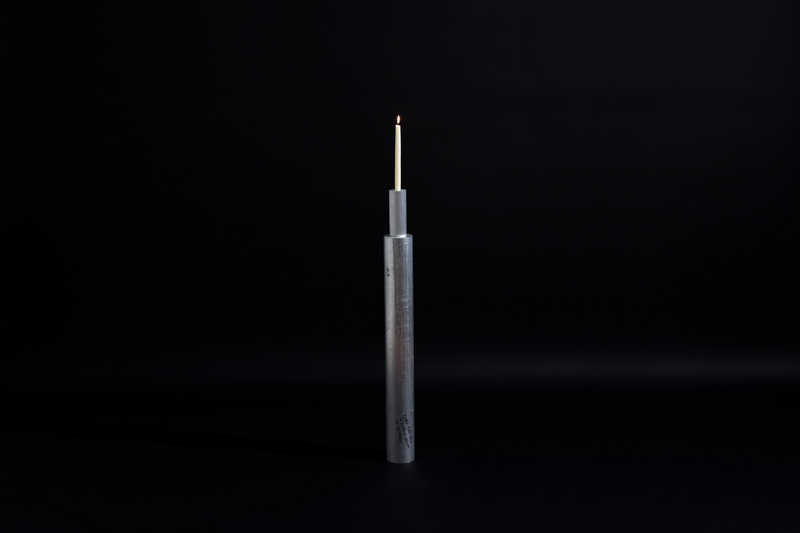 Candle Pillar explores a conjunction of the domestic, industrial, and absurd. 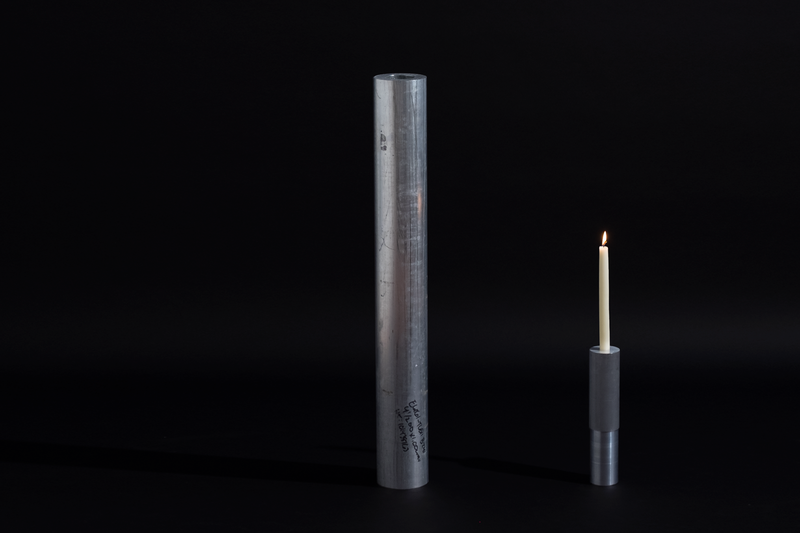 By only minimally intervening upon raw aluminum extrusions, a monumental homage is paid to a simple taper candle. 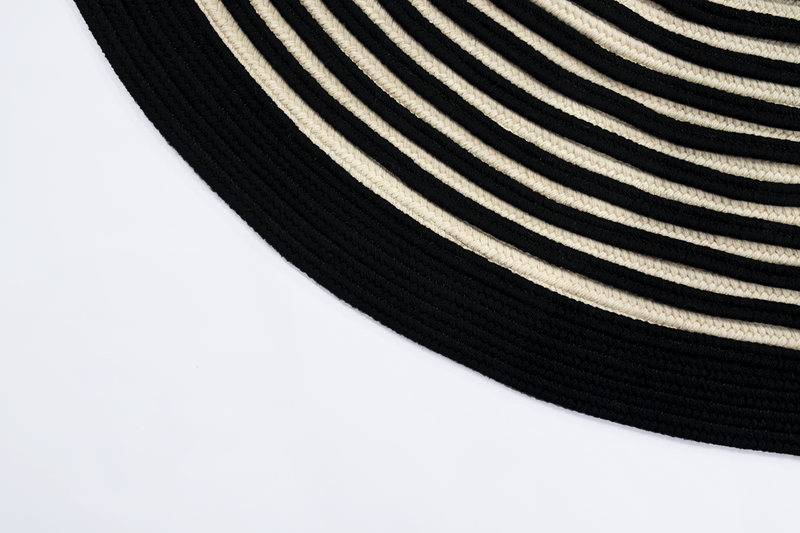 The nesting top allows the candle to rest in its intended base, or tabletop to enjoy a meal. 109cm tall. 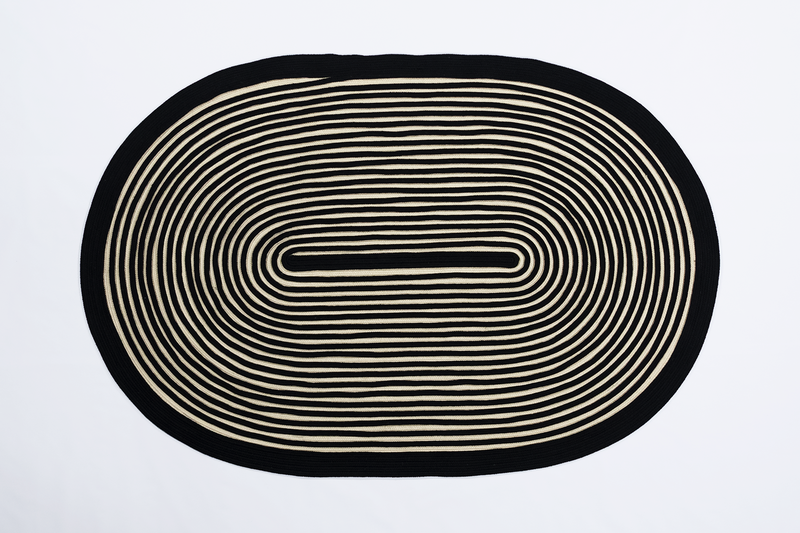 The Braided Pile Rug is a deconstruction and reconstruction of the archetypal Colonial American rug. 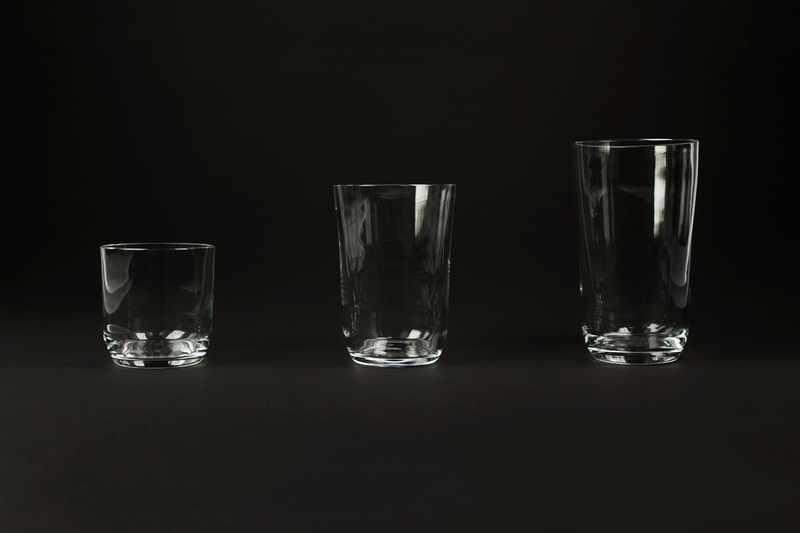 SMF glassware investigates what defines a “family” of objects. A legible sense of consistency is achieved through economizing the method of production. 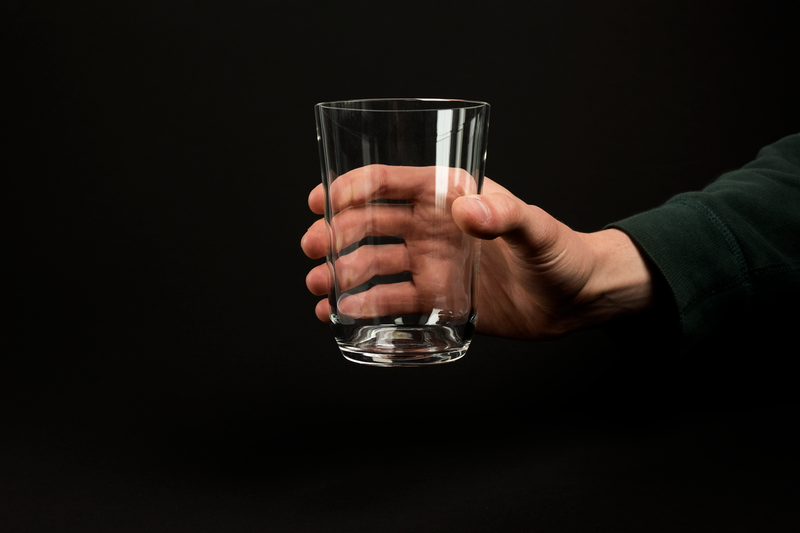 The three-piece set is blown in one mold and later cut to volume based on slight demarcations in the glass’ profile. Each size is formally autonomous but together the collection reads as familial owing to their origin: the Single Mold Family. 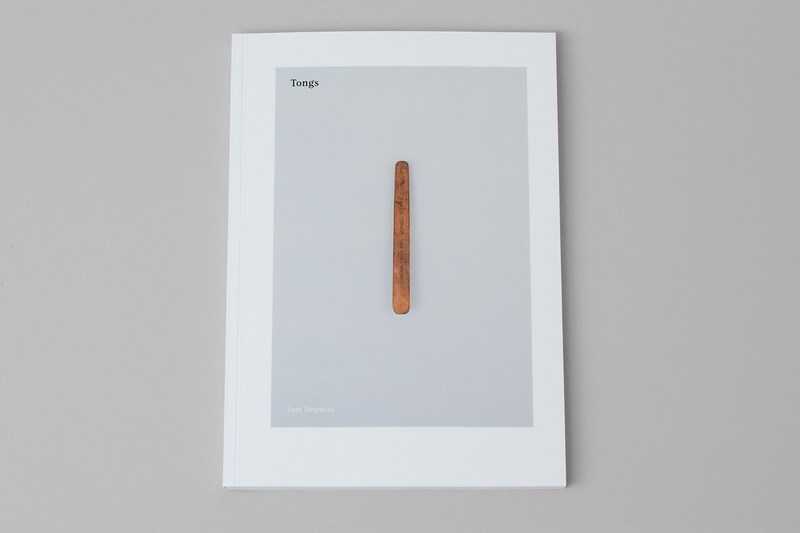 A survey of tongs and their purpose, this book explores the typology and subtly prods at the implications of their varied uses. The following essay, Hands in hand, is the forward text from the book. 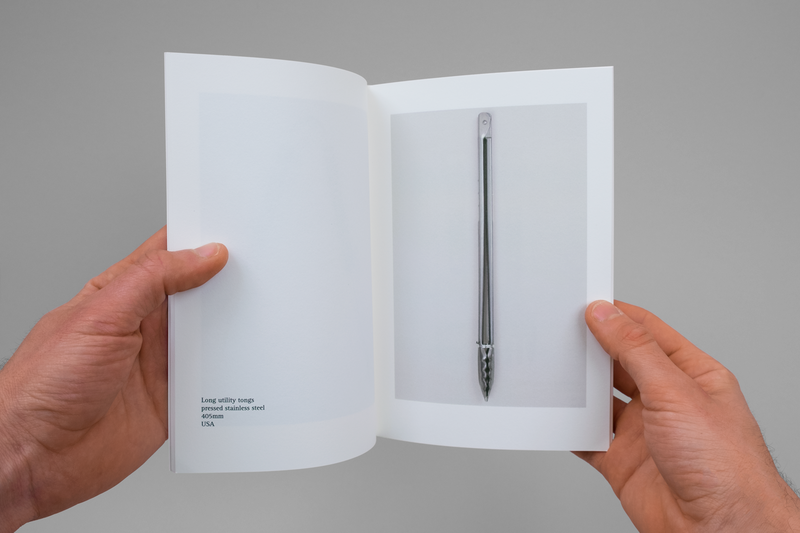 Printed in an edition of 25 in 2016. Our hands are capable of many tasks, however picking up soup is not one of them. 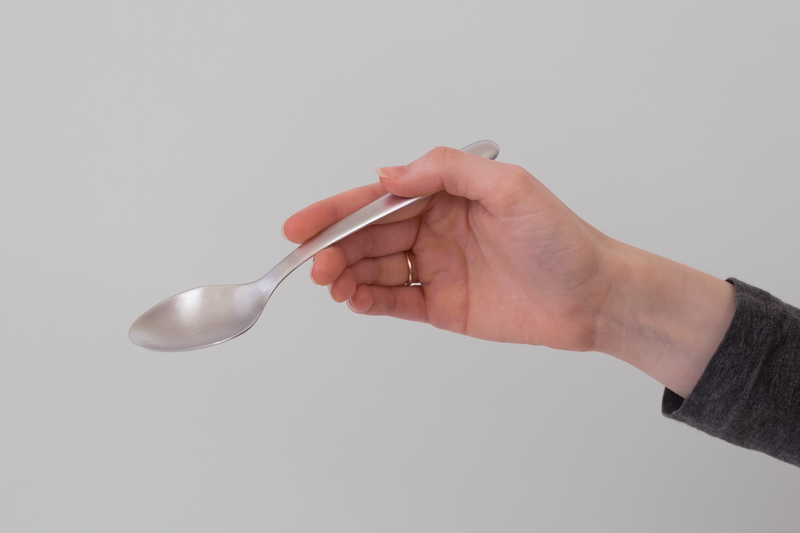 Instead of letting this challenge prohibit the enjoyment of soup’s pleasant warmth, we’ve devised using bowls and spoons to supplement our hands’ shortcomings. This supplementary aspect of everyday tools is why tongs pique my interest. Tongs are one of the rare tools that don’t supplement ability as much as they translate it. Using my hands to take a pastry from the bakery tray or dress a salad doesn’t offer a markedly different experience from using a set of tongs to do the same. This isn’t an absolute truism, but nonetheless opens up tongs to be examined for more than their purpose alone. Beyond ability, tongs translate a diversity of behavior, etiquette, and attitudes about how and where our hands may be used. There’s a certain comedy to this—the variety of ways people have proposed making hands for our hands—and the reasoning for doing so. Engaging with these nuances while compiling this collection, I feel I should apologize to any guests I’ve hosted for dinner: the salad was mixed by hand. Concave key responds to an observed behavior. When unlocking a door, a key oftentimes circumvents the job of a door handle. Insert, twist, and push—actions that take place while grasping the small key rather than the more comfortable intended point of contact: the doorknob. 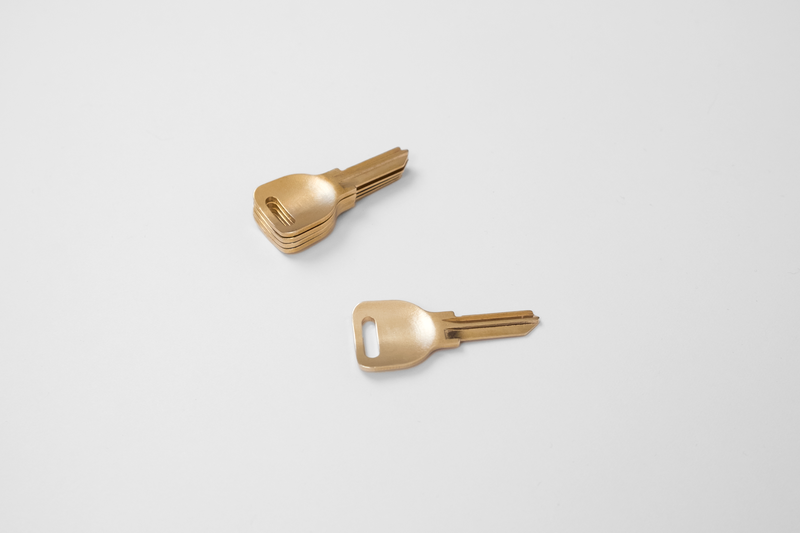 The concave top of this key provides a softer edge and more generous surface to grip while locking and unlocking. Multiples nest on a key ring. 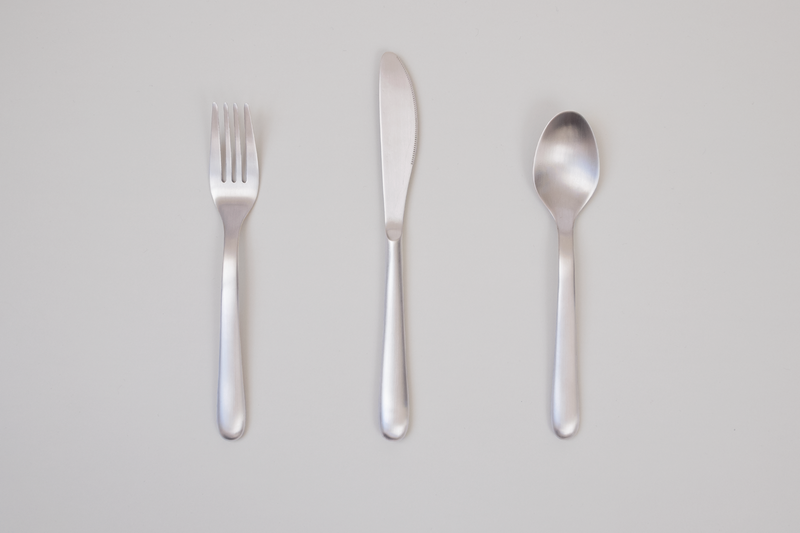 The objective of this cutlery set—fork, knife, spoon—is to communicate with scale. The proportions and prescribed purposes attributed to cutlery today can seem leftover from a dining culture of more formal conventions. The modest size and voluptuous handles of this cutlery make it more characteristic of today’s table: refined, broadly useful, and easygoing. 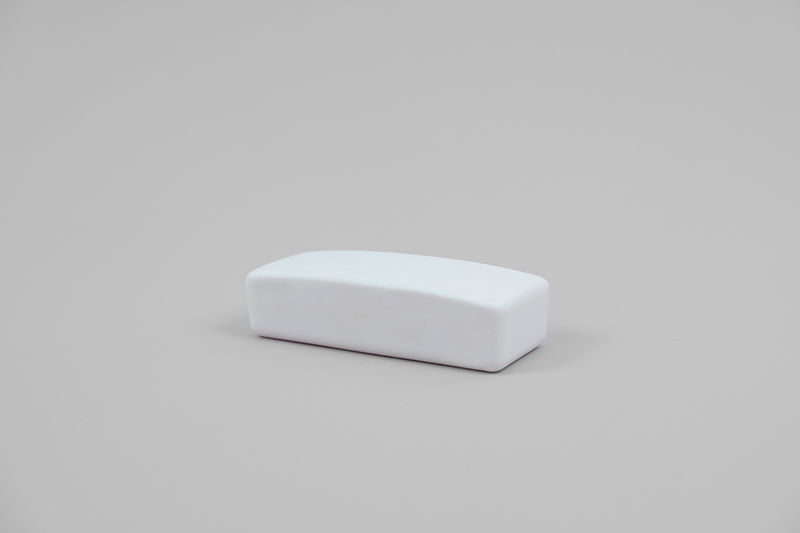 A bar of soap typically affords just enough heft to feel significant, but quickly recedes to a sliver. 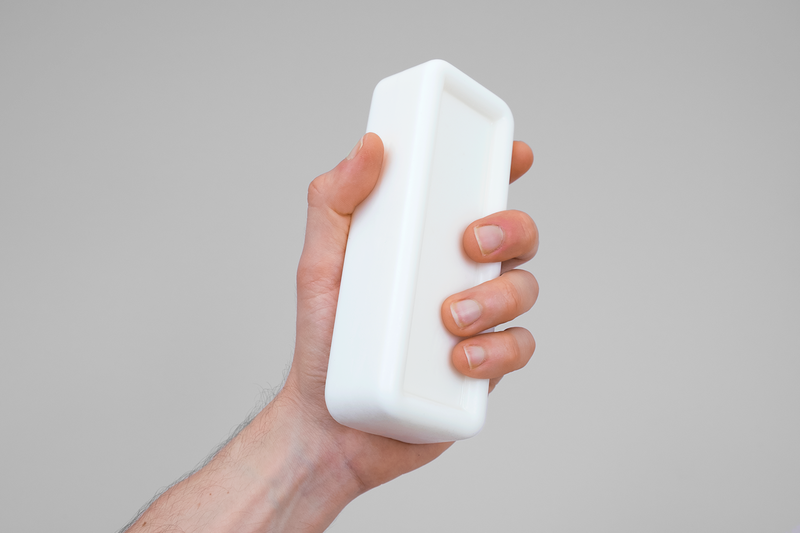 Scale and weight presented a window of opportunity to be disruptive but respectful in relation to soap as a tool. Sam Newman is a designer living and working in Portland, Oregon. After receiving an MFA from the Rhode Island School of Design in 2016, he continues to develop his own body of work in tandem with the opportunity to work for other designers.